Meet loads of top sci-fi and fantasy authors as the SFX Book Con returns! UPDATE We're very sorry to announce that, due to unforeseen circumstances, Malice/A Time of Dread author John Gwynne and The Psychology of Time Travel writer Kate Mascarenhas are no longer able to attend the event. After the massive success of the first SFX Book Con back in February 2018, the eagerly anticipated follow-up is on the way – and it’ll be bigger and longer, with even more top science fiction and fantasy authors. Our sister publication SFX magazine is the world’s number one sci-fi and fantasy mag and has teamed up with top bookshop Foyles once again, for a live event that celebrates science fiction/fantasy novels, and the people who write them. 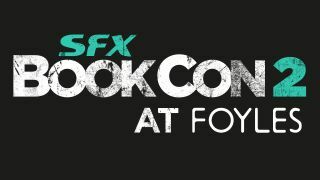 SFX Book Con 2 takes place on Saturday, November 10, 2018 at Foyles’ flagship Charing Cross Road store in London, and tickets are available now! It'll be a a day of panels, signing and mingling – with the opportunity for you to buy lots of books. There will also be goody bags.